Spy games always seem to be popular with children, no matter the generation. We try to encourage active play and chose toys that foster imagination for the kids. I'm sure we're not alone in feeling it's a bit difficult these days to find toys that motivate children to be active and imaginative rather than having a tablet or video game in their hands. When our friends at Mukikim suggested the SpyX Night Nocs binoculars to help us create some new active play opportunities for the kids this summer, we loved the idea. 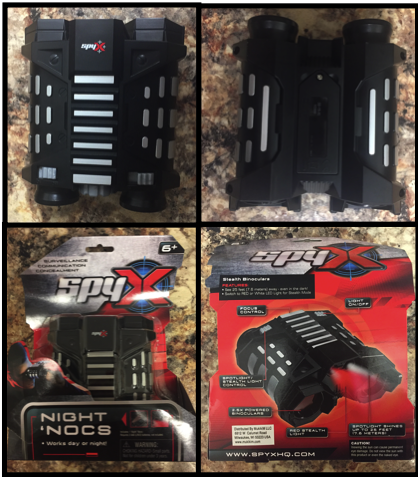 The SpyX Night Nocs are stealth binoculars that allow kids to see up to 25 ft. away in the dark. They are made of plastic and have an adjustable design just like real binoculars, complete with focus control, for junior agents to take on recon missions! The Night Nocs can switch from red to white light for extra stealth with a push of a switch. These Night Nocs also have a light on the front of them that can be turned on for nighttime spy work. As predicted, the kids went into spy mode immediately. We gave them the Night Nocs, some notepads and crayons to take secret spy notes and even found an old tape recorder to add to the role playing as they went on their 'stakeout'. It was hilarious to watch these 007s in action. We really like that it's a toy they can use indoors and outside day or night, so that we can sit on our lanai and relax while they fully entertained themselves with the Night Nocs. We'd love to deck them out in the other SpyX products to keep the fun going through the summer. Check out this unboxing video to get an in-depth look at the Mukikim SpyX Night Nocs! The people at Mukikim have generously offered our Across the Avenue readers a 10% discount on ANY Mukikim item! Just use the code avenuetoy at checkout to receive your discount, good through August 4, 2017. Disclaimer: The products in this post were provided by Mukikim. As always, our reviews are our own, honest opinions.